When you first look at the Quiet-Riter Eleven, you’re likely to think of post-WWII American design—its bulbous curves have more in common with a Hudson or a Buick than the sleek jobs coming out of Europe at the time. But don’t be fooled by appearances. Remingtons were prized for a reason. They flat out work. The Q-R 11 looks like it belongs in a GM showroom, but judging from its promotional literature, it was likely to be found in just about any American home. Like the Smith-Coronas of the time, the Remington typewriter represents American simplicity at its finest. These are easy-going typewriters. Unlike their German counterparts of the day, they have the laid-back basket shift. The German-made Olympia might have a softer touch, but the heavy lifting needed to raise its carriage is an extra bit of work that won’t be required here. Plus, it’s been my experience that such constant movement of the carriage leads to upper- and lower-case alignment issues—when the carriage slams down, it hits a moveable stop that eventually needs to be adjusted. Good for the typewriter repairman, bad for you! 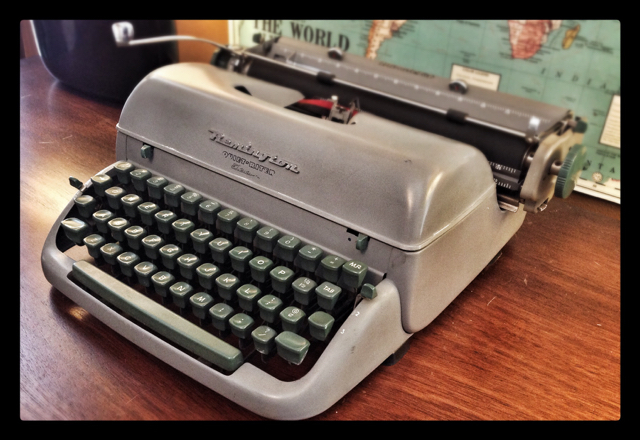 If you’re looking for a dependable machine that will hold up for hundreds of thousands of words, get a Remington. Beauty is in the eye of the beholder, and the soft, utilitarian lines of the Q-R 11 might even inspire you when you’re using it for writing. It gets the job done! I agree these are some of the most durable machines made. And I recommend them to people looking for a typewriter for their kids to play with. I am often surprised how much I like typing on one, especially considering how stiff they feel initially. I have one and I agree. The Q-R 11 is one typewriter I enjoy, so I added a Q-R, L-R. Hopefully I’ll find an Office-Riter to complete the collection. For me this is the best portable made by Remington. I have fallen for the Quiet Writer with the Miracle Tab. The looks didn’t do it for me. Of course these were small online pics, but after reading the reviews here, I now own a few machines and my latest was an impulsive purchase. The Riter looked clean and was fairly cheap. Just taken care of the machine today and I am very surprised by how easy it is to work with. Very steady, assured and comforting to type on. As a writer myself I have ended up with a small collection by default. Trying to find the one great machine. My ‘as new’ SM8 may be beautiful in every way, my Letters 22 super cute, my Good Companion very English, but this simply has oodles of charm. It is a delightfully designed machine. I was expecting a machine designed down to a price point with rattles and a looseness like my orange Seiko, but I am wrong! So much so, this beauty is solid. She has her original metal spools, clicks along quietly and has a film star like charisma, a lovely font too. What’s not to like. If anyone wants a heavy weight portable that skips along with you – go get a Quiet Writer. I love mine.